I am a student at living in Glasgow. I also write for an online magazine called Cuckoo Review and am the 2015 winner of the Matthew Hale Award. 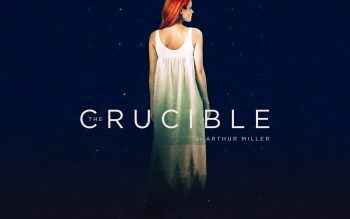 Arthur Miller's The Crucible is a play familiar to most. However, this is the first time I have seen a production of it that hasn't been completely forgettable. Instead, it was a heart-wrenching show. The acting, set, lighting and sound effects combined to make the show an experience and not just a momentary spectacle. This production also gave me a different perspective to a story I was already very familiar with as it concerned itself more with the dramatic intentions of Arthur Miller, who was using the Salem Witch Trials as an allegory for the anti-communist crusade of 1950's America. The atmosphere created throughout the performance was tense and ominous. The continuous dimmed lighting and uncluttered set made the stage feel cold and unwelcoming, which was fitting for this particular play. The captions displayed on the wooden set, with captions describing characters made the audience both alienated and in a way made us more omniscient, adding more of an element of dramatic irony. The acting and performances of individuals were stunning and emotionally loaded, you could not help but be drawn into the action. So much so, that if not for their facial features and the programme, I would not have guessed that a number of the actors were multi-roling. It wasn't until the very end of the play that I realised Augustina Seymour, played both Mary Warren and Rebecca Nurse. Her change in mannerisms and voice were on point. Diana Yekinni's accent as Tituba was also fantastic. I was also very impressed by David Kirkbride's performance as John Proctor especially during the court scene as he did well not to overdramatise in an already melodramatic play. The set was minimalistic, with only enough mis-en-scene to represent the setting of the scenes and make them come to life. The backdrop lit from behind really helped to subtly shift the atmosphere in the scenes when colours changed, as well as causing a startling effect during the Second Act. Most of the action took place on a manual revolve - which I feel – wasn't entirely necessary, as it posed no purpose during the actual scenes, only a point of interest during transitions, which were already a bit lengthy. All in all, I would certainly consider this a production worth watching. It was a very different interpretation of the play and a truly striking performance - in both its presentation and emotional impact.